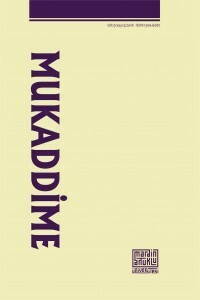 Journal of Mukaddime is a peer-reviewed journal which is published every year in May and November by Mardin Artuklu university Institution of Social Sciences. The journal is available both in print and online. The journal was published firstly in 2010. In the Mukaddime, the original works are given place which handle socio-cultural developments lived in historical process in the geography of Middle-east. With its published qualified academic contents, it aims to be one of the leading publishing items in evaluating regional developments. In the journal, a publication policy is followed with original studies that aim to contribute to social science in the highest level focusing on a religious, philosophical, historical and socio-cultural context on the Middle East Region. Priority is given to the publication of studies that are taking original ideas into consideration and handling issues in an analytical perspective in the related areas. In addition to this, the Journal of Mukaddime is open to all new comments, approaches and analysis of other social sciences that are connected to history, religion and sociology of the Middle East Region. In the journal, besides theoretical and analytical studies, book reviews/critiques, research notes and evaluating writings about conferences are also included. Thus, it has been aimed to be the pioneer for production of new ideas that are the reflection of the effects of mentioned views and approaches. In the journal APA and Chicago source and reference systems are used. Articles that are written in Turkish, English, Kurdish, Arabic and Persian languages are accepted. The Journal of Mukaddime is open accessed and authors and readers are not charged.